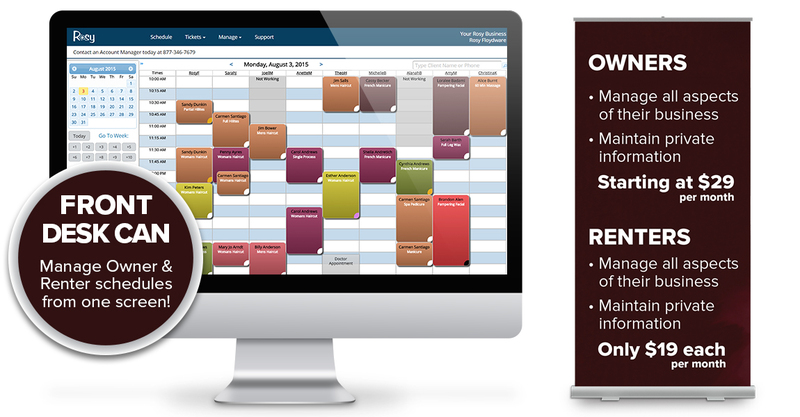 Rosy’s booth renter salon software allows owners to easily manage any or all of their stations as rentals. With all of the features that Rosy affords, owners and renters have the freedom to run their own business. Both owners and renters can set their permissions as they see fit, while having the option to let the front desk manage their schedules. The front desk can schedule appointments and check clients in for everyone, while the renter’s financials and client information remains private. For the first time, a salon client can seamlessly book services at the front desk for more than one service provider and even purchase products from the salon’s inventory. Renters can simply disconnect from the salon at any point and either operate independently or plug into another salon account down the road. It’s that easy!